for efficient global, and galactic transportation. At first this story may not seem a trend, just an event. But think: Richard Branson has made himself a multi-billionaire by correctly assessing markets and positioning himself to be the first to take advantage of their emergence. He would not build a space port, and a fleet of space ships for passengers paying $200,000 a pop if he didn't believe the market was there to support such! a venture. And what does one get for $200,000: "The two-and-a-half-hour flights will include about five minutes of weightlessness and views of Earth that until now only astronauts have been able to experience." From which we may conclude that while about 20 per cent of the American workforce is either out of work, or with only partial work, and millions more feel great financial stress, there are enough multimillionaires and billionaires who can pay six figures for a two and a half hour thrill ride that they will fill Branson's space ship seats, and use his space port. Can the disparity of wealth be made any clearer? It is the luxury terminal where wealthy tourists will blast into orbit for $200,000 per return trip. And Virigin's new space terminal in the New Mexico desert looked suitbaly futuristic as it was unveield yesterday. The building will house Virgin Galactic's spacecraft, mission control and a preparation area for travellers when flights begin sometime after the end of 2012. With his usual flair, British billionaire Richard Branson rappelled from a balcony, shook up a big bottle of champagne and took a swig while christening the building. HOW WILL SPACE TOURISM WORK? Branson's Virgin Galactic will stage its commercial space tourism venture from Spaceport America in a remote patch of desert in southern New Mexico. Branson was joined by Governor Susana Martinez, astronaut Buzz Aldrin and scores of would-be space travellers at the terminal-hangar for the dedication. It had been nearly a year since Branson was in New Mexico to celebrate the completion of the runway. With the spaceport and mothership completed, the company is now finalizing its rocket tests. 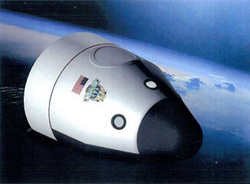 'We're ticking the final boxes on the way to space,' Branson said. He hopes enough powered test flights of Virgin Galactic's sleek spacecraft can be done by the end of 2012 to start commercial suborbital flights from the spaceport soon after. More than 450 people have purchased tickets to fly with Virgin Galactic. About 150 of them attended the ceremony. Before getting to enter the hangar, the crowd was treated to a flyover by WhiteKnightTwo, the mothership that one day will help take space tourists on suborbital flights. The $209 million taxpayer-financed spaceport will be a launch station for people and payloads on the rocket ships being developed for Virgin Galactic. It was six years ago that Virgin Galactic and New Mexico officials reached an agreement to build the spaceport. Officials said the completion of the terminal and hangar marks another major milestone that brings the dream of rocketing tourists into space closer to reality. Still, the question many are asking is when the first ships will launch from Spaceport America. It was Branson who once predicted the maiden passenger flight would take off in 2007..
Branson acknowledged the wait in an interview Monday. He and his two children will be among the first to fly, and he said he wants to ensure he can bring them home safely. Commercial service will start up after the company gets a license from the Federal Aviation Administration. NASA has already signed a $4.5million contract with the company for up to three chartered research flights. Tickets for rides aboard WhiteKnightTwo cost $200,000. The two-and-a-half-hour flights will include about five minutes of weightlessness and views of Earth that until now only astronauts have been able to experience. Like development of the spacecraft, construction of the 110,152-square-foot (10,233-square-meter) terminal and hangar facility has been complicated. There were delays, building code problems, contractor disputes and costly change orders. State officials blamed the unprecedented nature of the project as well as its remote location, the lack of infrastructure and the weather. 'This was quite a feat,' she said of the construction, joking with the crowd that she was glad the spacecraft fit in the cavernous hangar. The building was designed by United Kingdom-based Foster + Partners, along with URS Corp. and New Mexico architects SMPC. Virgin Galactic and officials with the New Mexico Spaceport Authority are touting the design as green. It uses geothermal energy; tubes running through the earthen berm surrounding part of the building help cool the interior; and natural ventilation can be used during mild seasons. Blue OriginBlue Origin is a privately funded aerospace company set up by Amazon.com founder Jeff Bezos. The company was awarded $3.7 million in funding in 2009 by NASA via a Space Act Agreement under the Commercial Crew Development (CCDev) program for development of concepts and technologies to support future human spaceflight operations. The company's innovative[peacock term] "pusher" Launch Abort System (LAS) was one of the technologies that was of particular interest to NASA. To date abort systems have been of thetractor variety, which pulls a crew vehicle to safety in case of an emergency. Initially focused on sub-orbital spaceflight, the company has built and flown a testbed of its New Shepard spacecraft design at their Culberson County, Texas facility. According to company statements, it initially planned on placing the New Shepard in commercial suborbital tourist service in 2010 with flights about once a week. 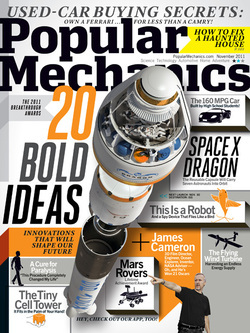 However, the most recently publicized timetable states that Blue Origin will fly unmanned in 2011, and manned in 2012. SpaceX designs, tests and fabricates the majority of their components in-house, including the Merlin, Kestrel, and Draco rocket engines. In December 2010, SpaceX became the first privately funded company to successfully launch, orbit and recover a spacecraft (a Dragon). Orbital Sciences http://orbital.comOrbital Sciences Corporation (OSC, though commonly referred to as Orbital) is an American company which specializes in satellite launch and manufacture. Its Launch Systems Group is heavily involved with missile defense launch systems. Orbital formerly owned ORBIMAGE (now GeoEye) and the Magellan line of GPS receivers, though they are now divested (the latter to Thales). Orbital's NYSE ticker symbol is ORB. It has its headquarters in the Dulles area of unincorporated Loudoun County, Virginia, United States.